I am a life long LEGO Maniac, and my kits from when I was a kid were passed down to my nephew, who has just passed them down to my son (40 years of history...). The trouble is that none of my old plans/directions are still around, and neither are the plans/direction from my nephew's kits. My nephew and I started to do a quick inventory, but he couldn't remember all of the kits that were in the hoard (3 LARGE boxes so far). Is there an easy way to figure this out? Does LEGO offer any of their old plans for free online or will I need to pay for them? Can any one offer help in identifying some of the fairly recent stuff? I can post images if needed. Some of the newer parts are quite unique. Your best shot is to identify an individual piece and look it up on Peeron, BrickLink or BrickSet. Since these all carry set inventories, you'll be able to find lists of sets in which the parts can be found. Try to start with more unique parts, chances are they are in a few models only. Once you're sure you've found a model for which you've all the parts, build it using the instructions from LEGO.com or for older models instruction scans PICSL. If identifying LEGO parts proves too difficult for some of them, ask experts. My usual method for identifying a set I'm not familiar with is to find the rarest part. It's not always possible to find the rarest part but I can usually guess which parts are rare given how many of them I have in my collection. For System sets I will usually ignore unmodified bricks, plates and tiles in common colours. When I was trying to find the set in the example shown below from this question. I ignored all the plates and the two black 1x1 studs as they were all common parts in standard colours. 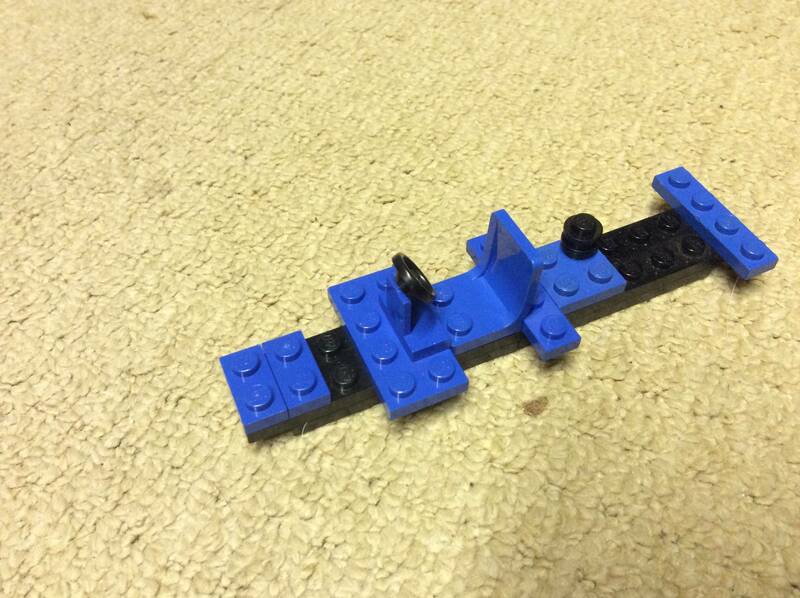 The only two parts remaining were the blue Minifigure Seat (4079) and the blue Steering Wheel (3829). From those two parts it was easy to identify it as a vehicle and with the arrangement of the pieces I could tell it was a four-stud wide vehicle. In the years 10 or so years it has become more common for LEGO to produce vehicles 6 or 8 studs wide so I assumed it was a fairly old set. To identify these two pieces I used the catalogue search on Bricklink, if I didn't know the name of these pieces I could have search by category, or if I knew the piece number (found often on the bottom of many parts) I could have searched for that two. 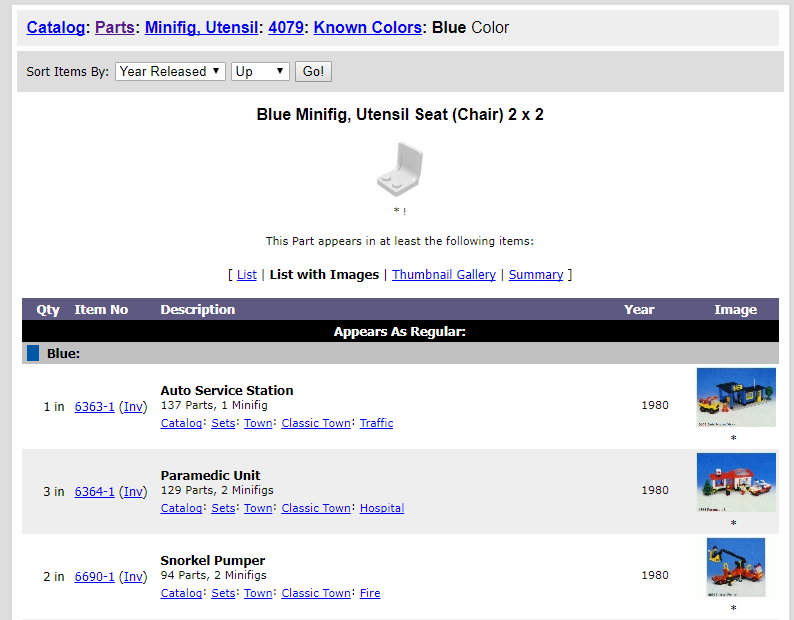 Every piece on Bricklink has a list of 'Known Colors', the steering wheel had 222 set entries for the colour blue and the steering wheel had the minifgure seat had 68 results for the colour blue. I sorted the list by selecting 'Year Released' to 'Up' so that I would see the oldest sets first and set the preview mode to 'List with Images' so that I could see both a photo of the set and relevant information. (I also recommend using 'Thumbnail Gallery'). The colours that I consider 'standard' are Red, Yellow, Green, Blue, Black and White. These colours are probably the most common and are almost always included in bulk brick buckets. Around 2004, the colour of light/dark grey and brown bricks were changed slightly. Modern grey bricks are often known as 'bley' because of their blueish tint. 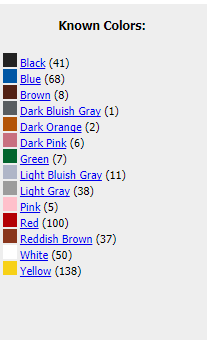 Related: What is the bley (blay) color? There was only one variation of the head for Minifigures prior to 1989, the classic smile head. This piece continues to be used for classic releases as well as Modular sets although it is not as common. Minifigures with two-sided heads were only first available in 2001. The first minifigures with realistic skin tones were released in 2003. Only yellow minifigures were available previously. Related: Why do some minifigs have yellow heads and some are flesh colored? We currently have over 3300 building instructions available onlinevwhich date back to sets packed in 2002. The minifigs, stickers and colors are usually enough at least point you to the right theme category (ie space, pirates, castle, city, star wars, etc.) and often will narrow it down even further. A logo or minifig is usually a giveaway of what set group you're looking for. For example a recent bulk buy I got had a number of Joker images on tiles and a number of unique purple and green colors that made it clear there was a Batman themed Joker set in the mix. From there you can look up parts lists on Bricklink or Peeron, as well as find directions for assembly. To narrow it down to a specific set and make sure you have all the parts. If your not super familiar with the lego themes these sites will also give you a place to find them. One very good way is to look for numbers on pieces, especially when they are printed. A number on a Lego piece is almost always the number of the set. These often come in places where there is supposed to be a number; like license plates on cars. If you have a license plate brick with a number, that's almost 100% certain to be the set that the car belongs to. There are exceptions; for example, the Lego trains from the eighties had a "timetable" sticker that listed several numbers; each number was the number of another train set. (In other words, each train had a separate entry on the timetable). If you find that sticker, you have either a railway station from that time, or a train set from that tine that included a timetable. But, this will still narrow down your search. How do I identify a Lego part? Can you identify a box that says LEGO Extra Parts no. 058?